For other uses, see Borax (disambiguation). Borax is a component of many detergents, cosmetics, and enamel glazes. It is used to make buffer solutions in biochemistry, as a fire retardant, as an anti-fungal compound, in the manufacture of fiberglass, as a flux in metallurgy, neutron-capture shields for radioactive sources, a texturing agent in cooking, as a precursor for other boron compounds, and along with its inverse, boric acid, is useful as an insecticide. In artisanal gold mining, borax is sometimes used as part of a process (as a flux) meant to eliminate the need for toxic mercury in the gold extraction process, although it cannot directly replace mercury. Borax was reportedly used by gold miners in parts of the Philippines in the 1900s. Borax was first discovered in dry lake beds in Tibet and was imported via the Silk Road to the Arabian Peninsula in the 8th century AD. Borax first came into common use in the late 19th century when Francis Marion Smith's Pacific Coast Borax Company began to market and popularize a large variety of applications under the 20 Mule Team Borax trademark, named for the method by which borax was originally hauled out of the California and Nevada deserts. The structure of borax according to X-ray crystallography. From the chemical perspective, borax contains the [B4O5(OH)4]2− ion. In this structure, there are two four-coordinate boron centers and two three-coordinate boron centers. Borax is very soluble in ethylene glycol, moderately soluble in diethylene glycol and methanol, slightly soluble in acetone. It is poorly soluble in cold water, but its solubility increases significantly with temperature. The English word borax is Latinized: the Middle English form was boras, from Old French boras, bourras. That may have been from medieval Latin baurach (another English spelling), borac(-/um/em), borax, along with Spanish borrax (> borraj) and Italian borrace, in the 9th century. Another name for borax is tincal, from Sanskrit. The word tincal /ˈtɪŋkəl/ "tinkle", or tincar /ˈtɪŋkər/ "tinker", refers to crude borax, before it is purified, as mined from lake deposits in Tibet, Persia, and other parts of Asia. The word was adopted in the 17th century from Malay tingkal and from Urdu/Persian/Arabic تنکار tinkār/tankār; thus the two forms in English. These all appear to be related to the Sanskrit टांकण ṭānkaṇa. Borax occurs naturally in evaporite deposits produced by the repeated evaporation of seasonal lakes. The most commercially important deposits are found in: Turkey; Boron, California; and Searles Lake, California. Also, borax has been found at many other locations in the Southwestern United States, the Atacama desert in Chile, newly discovered deposits in Bolivia, and in Tibet and Romania. Borax can also be produced synthetically from other boron compounds. 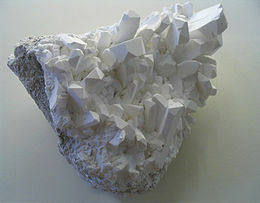 Naturally occurring borax (known by the trade name Rasorite–46 in the United States and many other countries) is refined by a process of recrystallization. Borax is used in various household laundry and cleaning products, including the "20 Mule Team Borax" laundry booster, "Boraxo" powdered hand soap, and some tooth bleaching formulas. Borate ions (commonly supplied as boric acid) are used in biochemical and chemical laboratories to make buffers, e.g. for polyacrylamide gel electrophoresis of DNA and RNA, such as TBE buffer (borate buffered tris-hydroxymethylaminomethonium) or the newer SB buffer or BBS buffer (borate buffered saline) in coating procedures. Borate buffers (usually at pH 8) are also used as preferential equilibration solution in dimethyl pimelimidate (DMP) based crosslinking reactions. The sodium ions introduced do not make water ‘hard’. This method is suitable for removing both temporary and permanent types of hardness. A mixture of borax and ammonium chloride is used as a flux when welding iron and steel. It lowers the melting point of the unwanted iron oxide (scale), allowing it to run off. Borax is also used mixed with water as a flux when soldering jewelry metals such as gold or silver, where it allows the molten solder to wet the metal and flow evenly into the joint. Borax is also a good flux for "pre-tinning" tungsten with zinc — making the tungsten soft-solderable. Borax is often used as a flux for forge welding. A rubbery polymer sometimes called Slime, Flubber, 'gluep' or 'glurch' (or erroneously called Silly Putty, which is based on silicone polymers), can be made by cross-linking polyvinyl alcohol with borax. Making flubber from polyvinyl acetate-based glues, such as Elmer's Glue, and borax is a common elementary-science demonstration. Borax, given the E number E285, is used as a food additive in some countries but is banned in some countries, such as the United States, China, and Thailand. As a consequence, certain foods, such as caviar, produced for sale in the United States contain higher levels of salt to assist preservation. In addition to its use as a preservative, borax imparts a firm, rubbery texture to food. In China, borax (Chinese: 硼砂; pinyin: péng shā or Chinese: 月石; pinyin: yuè shí) has been found in such foods as lamian, shahe fen, kway teow, and chee cheong fun. In Indonesia, it is a common, but forbidden, additive to such foods as noodles, bakso (meatballs), and steamed rice. The country's Directorate of Consumer Protection warns of the risk of liver cancer with high consumption over a period of five to ten years. Borax, sodium tetraborate decahydrate, according to one study, is not acutely toxic. Its LD50 (median lethal dose) score is tested at 2.66 g/kg in rats, meaning that a significant dose of the chemical is needed to cause severe symptoms or death. The lethal dose is not necessarily the same for humans. On pesticide information websites it is listed as a non-lethal compound and of no hazardous concerns. EPA has determined that, because they are of low toxicity and occur naturally, boric acid and its sodium salts should be exempted from the requirement of a tolerance (maximum residue limit) for all raw agricultural commodities. Although it cited inconclusive data, a re-evaluation in 2006 by the EPA still found that "There were no signs of toxicity observed during the study and no evidence of cytotoxicity to the target organ." In the reevaluation, a study of toxicity due to overexposure was checked and the findings were that "The residential handler inhalation risks due to boric acid and its sodium salts as active ingredients are not a risk concern and do not exceed the level of concern..." but that there could be some risk of irritation to children inhaling it if used as a powder for cleaning rugs. Conditions defined as "over-exposure" to borax dust can cause respiratory irritation, while no skin irritation is known to exist due to borax. Ingestion may cause gastrointestinal distress including nausea, persistent vomiting, abdominal pain, and diarrhea. Effects on the vascular system and human brain include headaches and lethargy, but are less frequent. "In severe poisonings, a beefy red skin rash affecting palms, soles, buttocks and scrotum has been described. A draft risk assessment released by Health Canada in July 2016 has found that overexposure to boric acid has the potential to cause developmental and reproductive health effects. Since people are already exposed to boric acid naturally through their diets and water, Health Canada advised that exposure from other sources should be reduced as much as possible, especially for children and pregnant women. The concern is not with any one product, but rather multiple exposures from a variety of sources. With this in mind, the department also announced that registrations for certain pesticides that contain boric acid, which are commonly used in homes, will have their registrations cancelled and be phased out of the marketplace. As well, new, more protective label directions are being introduced for other boric acid pesticides that continue to be registered in Canada (for example, enclosed bait stations and spot treatments using gel formulations). The Indonesian Directorate of Consumer Protection warns of the risk of liver cancer with high consumption of borax over a period of 5–10 years. Borax was added to the Substance of Very High Concern (SVHC) candidate list on 16 December 2010. The SVHC candidate list is part of the EU Regulations on the Registration, Evaluation, Authorisation and Restriction of Chemicals 2006 (REACH), and the addition was based on the revised classification of borax as toxic for reproduction category 1B under the CLP Regulations. Substances and mixtures imported into the EU which contain borax are now required to be labelled with the warnings "May damage fertility" and "May damage the unborn child". It was proposed for addition to REACH Annex XIV by the ECHA on 1 July 2015. If this recommendation is approved, all imports and uses of borax in the EU will have to be authorized by the ECHA. [needs update] Review of the boron toxicity (as boric acid and borates) published 2012 in Journal of Toxicology and Environmental Health concluded: "It clearly appears that human B [boron] exposures, even in the highest exposed cohorts, are too low to reach the blood (and target tissue) concentrations that would be required to exert adverse effects on reproductive functions." ^ Levy, H. A.; Lisensky, G. C. (1978). "Crystal structures of sodium sulfate decahydrate (Glauber's salt) and sodium tetraborate decahydrate (borax). Redetermination by neutron diffraction". Acta Crystallographica Section B Structural Crystallography and Crystal Chemistry. 34 (12): 3502–3510. doi:10.1107/S0567740878011504. ^ a b c NIOSH Pocket Guide to Chemical Hazards. "#0057". National Institute for Occupational Safety and Health (NIOSH). ^ NIOSH Pocket Guide to Chemical Hazards. "#0059". National Institute for Occupational Safety and Health (NIOSH). ^ NIOSH Pocket Guide to Chemical Hazards. "#0058". National Institute for Occupational Safety and Health (NIOSH). ^ "Potential Commodities NFPA 704" (PDF). Archived from the original (PDF) on 2016-05-17. Retrieved 2018-12-09. ^ "March 2012 ipad ewaste Filipino Borax, Pakistans Pollution, Artisanal Gold Mining". Blacksmithinstitute.org. Archived from the original on 2016-10-13. Retrieved 2016-08-07. ^ a b "Borax (Na2B4O7·10H2O ) – Sodium Borate – Occurrence, Discovery and Applications". Amoz.com. 2004-08-16. ^ Mendham, J.; Denney, R. C.; Barnes, J. D.; Thomas, M. J. K. (2000), Vogel's Quantitative Chemical Analysis (6th ed. ), New York: Prentice Hall, ISBN 0-582-22628-7 p. 316. ^ Staff. "Creating Flame Colors". The Science Company. Retrieved November 30, 2008. ^ "BORAX DECAHYDRATE (Sodium Tetraborate Decahydrate)". ^ Wizniak, Jaime (July 2005). "Borax, Boric Acid, and Boron – From exotic to commodity" (PDF). Indian Journal of Chemical Technology. 12 (4). ISSN 0975-0991. ^ Hammond, C. R. (2004). The Elements, in Handbook of Chemistry and Physics 81st edition. CRC press. ISBN 978-0-8493-0485-9. ^ Peacock, Andrew C.; Dingman, C. Wesley (1967). "Resolution of Multiple Ribonucleic Acid Species by Polyacrylamide Gel Electrophoresis". Biochemistry. 6 (6): 1818–1827. doi:10.1021/bi00858a033. ^ Anderson, S. (1981). "Shotgun DNA sequencing using cloned DNase I-generated fragments". Nucleic Acids Research. 9 (13): 3015–27. doi:10.1093/nar/9.13.3015. PMC 327328. PMID 6269069. ^ Dodd, J.G. (1966). "Soft soldering to tungsten wire". Am. J. Phys. 34 (10): xvi. doi:10.1119/1.1972398. ^ "The borax method" (PDF). Borax replacing mercury in small-scale mining. The Geological Survey of Denmark and Greenland (GEUS). Archived from the original (PDF) on 2008-12-06. Retrieved 2008-08-02. ^ Parratore, Phil (1998). Wacky Science: A Cookbook for Elementary Teachers. Dubuque, IA: Kendall Hunt. p. 26. ISBN 978-0-7872-2741-8. ^ "Slime Recipe - How to Make Borax and White Glue Slime". Chemistry.about.com. Retrieved 2016-08-07. ^ Reiley, Laura (April 22, 2019). "After China turned it into a cheap snack, caviar is at risk of losing its status as a luxury good". The Washington Post. Retrieved April 22, 2019. ^ "Caviar glossary". The Caviar Guide a gourmet review of caviars & fish roe. Hanson Ltd, Geneva, Switzerland. Archived from the original on 2008-12-08. Retrieved 2008-07-07. ^ "Chinese Ingredients: Borax Powder, Mushroom Extract – Chowhound". Chowhound.chow.com. Retrieved 2016-08-07. ^ a b "Watch Out For The Food We Consume". Directorate of Consumer Protection, Jakarta, Indonesia. 2006. Archived from the original on December 28, 2008. Retrieved 2009-02-10. ^ "Centre for Alternative Technology". Cat.org.uk. Archived from the original on 2012-08-01. Retrieved 2016-08-07. ^ "Borax". Nature.berkeley.edu. Retrieved 2016-08-07. ^ Marie, Anne. "How To Color Fire – Fun Fireplace Instructions". Chemistry.about.com. Retrieved 2016-08-07. ^ a b "Pesticide Reregistration Status | Pesticides | US EPA" (PDF). Epa.gov. Retrieved 2016-08-07. ^ "Pesticides | US EPA" (PDF). Epa.gov. 2015-08-20. Retrieved 2016-08-07. ^ "Safety Data Sheet : acc. to OSHA HCS" (PDF). Aquasolutions.org. Retrieved 2016-08-07. ^ "Information Update – Health Canada advises Canadians to avoid homemade craft and pesticide recipes using boric acid – Recalls & alerts – Healthy Canadians Website". Healthycanadians.gc.ca. 2016-07-22. Retrieved 2016-08-07. ^ Member state committee draft support document for identification of disodium tetraborate, anhydrous as a substance of very high concern because of its CMR properties. Adopted on 9 June 2010. Echa.europa.eu. Retrieved on 2012-02-17. ^ Recommendation of the European Chemicals Agency of 1 July 2015 for the inclusion of substances in Annex XIV to REACH (List of Substances subject to Authorisation) Echa.europa.eu. Retrieved on 2015-07-06. ^ Bolt, Hermann M.; Başaran, Nurşen; Duydu, Yalçın (2012). "Human Environmental and Occupational Exposures to Boric Acid: Reconciliation with Experimental Reproductive Toxicity Data". Journal of Toxicology and Environmental Health, Part A. 75 (8–10): 508–514. doi:10.1080/15287394.2012.675301. PMID 22686310. Wikimedia Commons has media related to Borax. Look up borax in Wiktionary, the free dictionary. Wikisource has the text of the 1879 American Cyclopædia article Borax.